Last year, I wrote a post or two about my favorite running things, all the essentials I need to have a good run. As with most things in life, as I have become a more experienced and [sometimes] injured runner, this list has grown and changed a bit. So, here's a new list of my favorite things AND a special discount on my absolute must-have running essential- Enell Sports Bras- just for Sparkly Runner readers! Read on to find out how you can get some discounted "support" in your life! Old Navy Activewear: Cheap, cute, and fun, Old Navy really has some great workout/running clothes. My favorites include bright printed capris/leggings and tanks with sassy fitness sayings. Sparkle Skirts: These skirts are pricey but are totally worth it in my opinion. Hand-made in the USA, they feature two large pockets on the built-in shorts and one large pocket on the waistband. And they can be worn forward or backward- it all depends on where you want that waistband pocket. Flip Belts: When I'm not wearing a skirt with built in shorts, I'm wearing this belt. With a clip for your keys and plenty of room to store fuel, money, ID, credit cards- whatever really- these belts are the only ones I've found that are comfy and don't move at all when running. And they are super affordable- under $30. KIND Healthy Grain Bars: I'm always on the lookout for a low-point, healthy bar to take with me on long runs. The KIND Healthy Grain bars do the trick! Five grains, gluten-free, and only 4 PPV- and they're really, really good! My favorite variety is the Maple Pumpkin Seed. Altras: After doing a lot of research on what shoes are best for runners with arthritis, I settled on getting a pair of Altras. Getting used to the zero-drop was interesting but I really love the cushioning and wide toe box of these shoes. Asics: After being injured this fall, I am constantly rotating shoes so my feet will gain strength in different areas with each different shoe. My PT recommended Asics and I love the GT-2000's I currently run in. They are supportive and comfortable. Feetures Plantar Fasciitis Sleeves: I haven't talked about it much here but I have some wicked Plantar Fasciitis occasionally. These sleeves help with circulation, pain-relief, and swelling. And they just make my feet feel good! GYMBOSS timer: As a firm believer in the Galloway run/walk method, this timer is vital to my success. It can be set for any type of interval you want, can vibrate or beep or both, and will last for 99 intervals- essential for the long run. And it's under $20 and won't drain your battery like a phone app. Oiselle Journal: A gift from a sweet, sweet friend (Steph at GooberMonkey), this journal has been helping me really nail down goals, obstacles, and successes in a way that only writing by hand can do. It's nice to actually have to write out my thoughts as opposed to typing- where I can go back, delete and start again. You can't do that when you're writing by hand and it's helping me to really focus on where I want my training to go in 2015. Foam Roller: You can get one of these anywhere and the benefits are awesome! It's like giving my legs a massage every day- even though it hurts sometimes :-) But foam rolling is an excellent way to keep all your muscles, tendons, and ligaments stretched out and warm- thus helping with increased flexibility and decreased risk of injury. Enell: You know I love these bras- what I've been loving recently is all the new colors they've come out with! I love wearing a tank top now just so I can see Scuba Duba Blue or Raspberry Zest peeking out! Want to get one of these new Enell colors for yourself? Head on over to Enell.com and use code "SPARKLY10" to save 10% on your purchase! This code is valid 3/11/15- 3/18/15 so don't delay in bringing some colorful support into your (or your favorite female runner's) life! 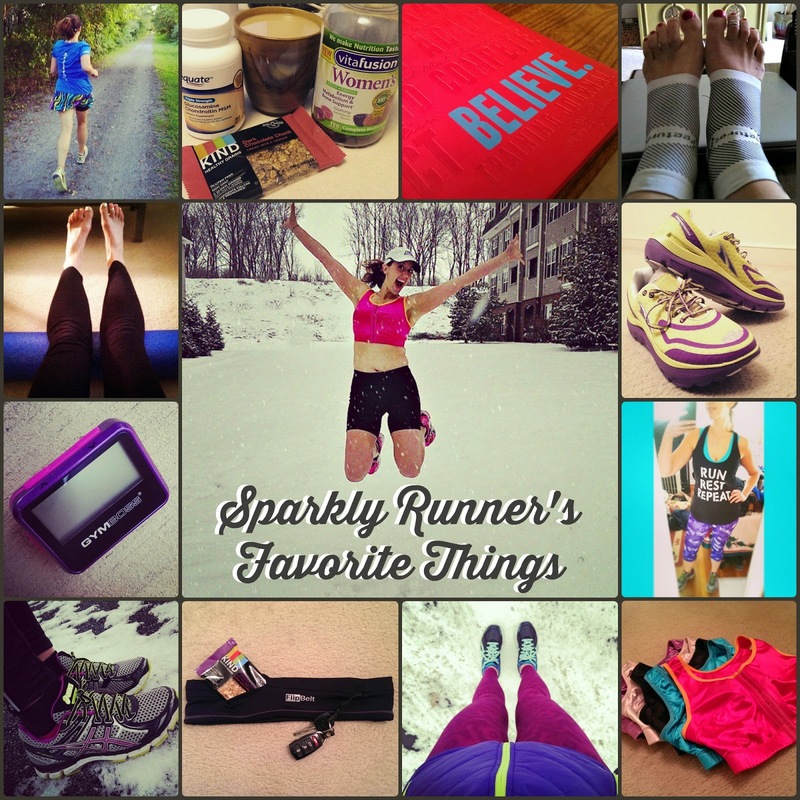 What's your favorite running essential? I loved and still love my original Altra Torin's but the Torins 1.5 didn't fit quite right, I was a sad girl. I just ordered the paradigms and had to return them :( I want a pair of Altras again. I am a gymboss fan too :) It has been a great timer and helped in the summer heat! Yes! Gymboss is seriously so great- I wish I would have ordered one sooner!